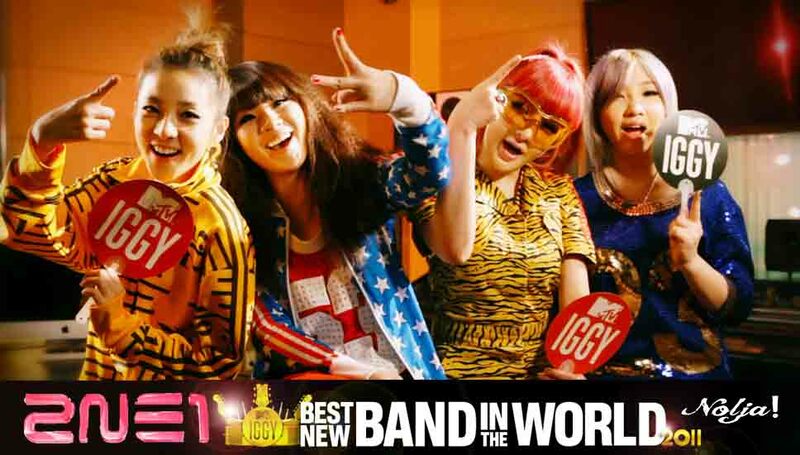 2ne1 is the BEST NEW BAND IN THE WORLD!!! So says MTV Iggy after their half a year long competition and so Blackjacks have been saying all along!! Yeah and Verily, Tis a time for new avaters and sigs because bragging rights abound! Two MTV historical wins in a freaking row!!!!!!!!!!!!! I guess after rain comes sunshine! YG Entertainment just had some awful experiences this year with artists being embroiled in scandals, negative rumours and news of dipping stock prices. Fans have been pretty sober but sticking by them though because I guess we believe in the brand! You can’t imagine how just freaking awesome it is for us now after all the darkness to get these kinds of distinctions not even from the Kpop world but from the International community!!! Sorry but this is a spazz post in case you didn’t notice! BUT THE AWESOMEST NEWS IS THAT MTV IGGY IS GONNA HAVE THEM PERFORM AT TIMES SQUARE!!!!!!!!!!!!!!!!!!!!!! OHMAIGAHHHHHHHHHH!!!!!!!!!!!!!!!!!!!!!!!!!! NEW YORKERS YOU ARE SO DAMN LUCKY!!!!!!!!!! Check out videos below of the girls talking about themselves, winning and coming to NY!